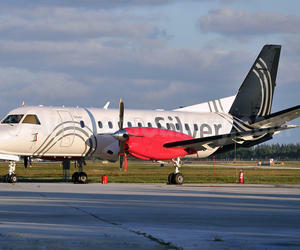 Flight 098 of the US airline Silver Airways landed on November 3 in Santiago de Cuba with 34 people onboard to open this eastern Cuba city to direct commercial flights from the United States. The aircraft, a small SAD 340-B, was received by the traditional water baptism. It is the first of the daily one hour-fifty five minutes flights from Fort Lauderdale to Santiago de Cuba. Silver Airways representative in Cuba, Jorge Vargas, told the press that his airline is the only American airline with flights to Santa Clara, Holguin, Camaguey and Cienfuegos airports, and that they will also open routes to Cayo Coco, Varadero and Manzanillo city.